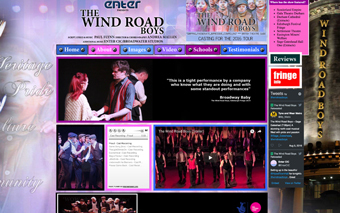 We were delighted to see that The Wind Road Boys received some great TV, radio and newspaper reviews. We have a number of contacts within the media industry so we invited them to attend The Wind Road Boys production and also to our rehearsals. On Thursday 30th May 2013 we were delighted to welcome Katie Oakes from ITV Tyne Tees news. Katie watched some of The Wind Road Boys rehearsals and then interviewed three of our students. The students, Ben, Dane and Lauren were asked about their experiences with Enter CIC and what it was like to perform at Sunderland Empire where The Wind Road Boys first premiered. The young people were no strangers to the TV cameras and provided a great feature for Friday’s (31st May 2013) Tyne Tees news programme. In the build up to The Wind Road Boys we were contacted by a number of newspapers interetsed in our story. The Journal newspaper asked for a telephone interview with one of the West End stars from the show. We asked Glen Joseph, who played the leading role of George Turner in the show if he would be interested in an interview. David Whetstone from The Journal contacted Glen and conducted the interview which was published in The Journal on May 27th 2013. To see the story click here. 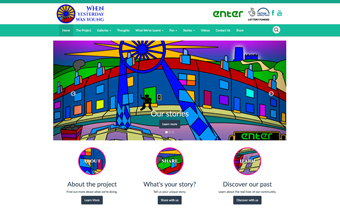 Northern Echo Journalist Mark Tallentire visited our centre to speak with director of the show Andrea Flynn to get a background to the story. To see the article click here. We were absolutely delighted when we found out that The Northern Echo would be attending The Wind Road Boys performance at the Gala Theatre, Durham. 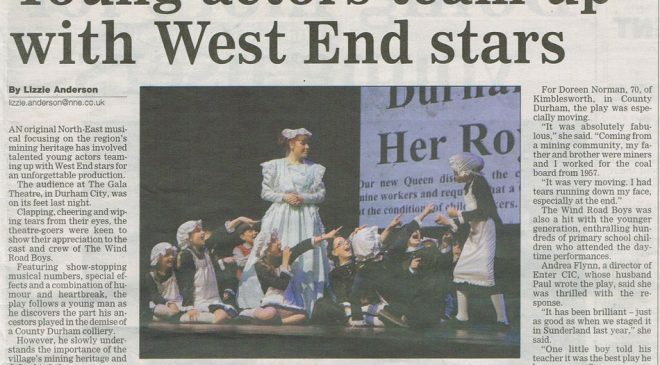 Lizzie Anderson from The Northern Echo attended the show on Wednesday evening (12th June 2013) to review the production. We were very excited to read the review on the Thursday morning and then again in the follow up story in Friday’s addition. We would like to thank Lizzie for taking an interest in our project and we look forward to working with The Northern Echo in the future. Lizzie Anderson, The Northern Echo. We have recently been in contact with well known North East Radio Station ‘Star Radio’. After a meeting with the station they were so moved by what we do with young people that they decided to support our cause. Louise Fewster, Head of News for Star Radio attended our rehearsals and interviewed the West End actors. 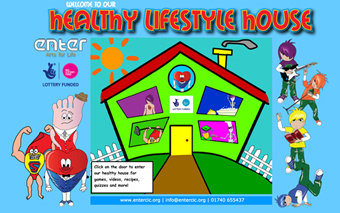 The clips were used for the radio adverts below. Have a listen. We were also delighted to welcome Robert Nichols, a reporter for One Giant Leap fanzine to our production. Robert provided a fantastic review of the show which can be seen here http://fansonline.net/onegiantleap/article.php?id=1265. We have received some really great feedback from the show and we would like to thank everyone for supporting this fantastic project.